Archive for category: What’s your poison? You are here: Home / Mushroom Diary Blog / What's your poison? Poisonous toadstools. 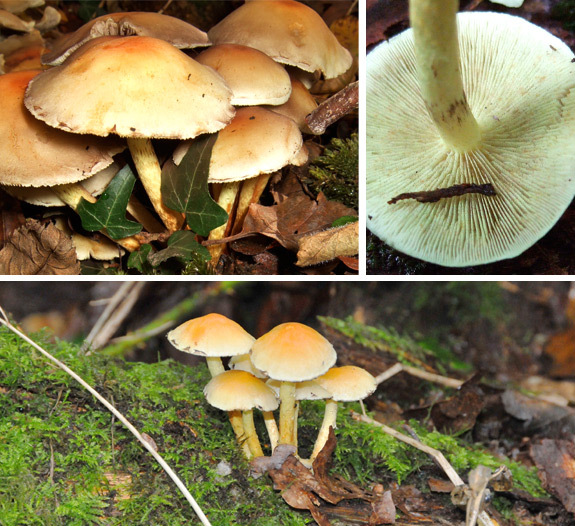 Identification of mushrooms and toadstools to avoid, from mildly poisonous to deadly. Experienced foragers often say, if you want to familiarise yourself with only a few mushrooms, it’s always best to recognise the deadly ones! Wise words indeed. The Fool’s Funnel (Clitocybe rivulosa aka C.dealbata) is one of the more common poisonous species to be found in the UK, as well as in Europe and North America. It appears, alarmingly enough, in some very ‘people orientated’ places such as lawns, parks, road sides etc; in sandy soil, during late summer to late autumn. Although not that large (around 4-6cm when mature), they often grow in small to medium groups and sometimes partial or full rings in grass. One of the largest partial rings I found were right in the middle of a local park. The cap is powdered white often with concentric rings or blotch marks which show the darker buff coloured flesh beneath (or even cracking, depending on condition). This is a good identification marker to note. The shape is initially rounded but it soon flattens out, usually developing the common ‘funnel shape’ and the margin remains slightly inrolled. 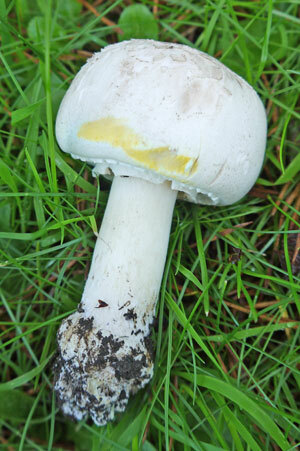 In this case (typical for a funnel mushroom) the white/whitish-buff gills run decurrently down the stem (which share the same colour as the cap). They are quite crowded and turn more buff coloured as the fungi ages. Last but not least; the flesh, if crushed between the fingers, will deliver a ‘sweetish’ smell, but I’d advise you wash or wipe your hands afterwards, and make sure you’re not tempted to a little nibble! Clitocybe rivulosa where the white powder surface has faded to reveal the darker flesh beneath. In this case, it has a ‘cracked’ appearance. 3-6cm diameter. Initially convex, then flattened out, often funnel shaped. Powdered white, often with concentric or buff flesh markings. Flesh is buff; smells sweet. 2-4 x 0.5-1cm; similar colouring as cap. Often slightly woolly at the base. In small-medium groups, full or partial rings in grass of gardens, parks, roadsides, path edges (sandy soil). Summer – autumn. For one reason or another I didn’t get the chance to get out much over winter, but a recent visit to some nearby woodland turned up these little black beauties. As they were well camouflaged, I nearly walked by this mass of Black Bulgar (Bulgaria inquinans) on a fallen trunk (possibly Ash). 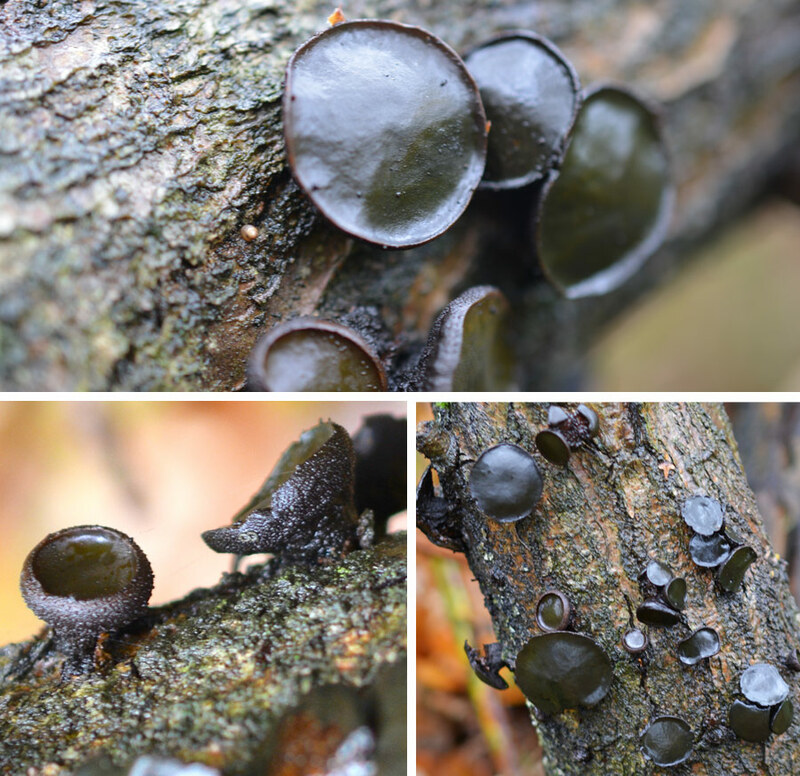 There were many dozens of these small black jelly-like buttons scattered across the bark. They genuinely look and feel like a typical jelly fungus, but they’re actually not jelly fungi at all – scientifically speaking, as they are in the class/division of Ascomycetes, instead of the real ‘Jelly fungi’ (heterobasidiomycetes) which are in the division Basidiomycetes. So there you go – lesson over! They grow in large clusters on deciduous fallen/felled trunks and branches, especially oak, beech and less often, on ash. But with the recent Ash Dieback disease and many felled trees as a result, they may well become more of a common sight. When young, the margin is tightly enrolled, giving the fruiting body a tiny cup like appearance with a brown/dark drown outer surface which has a rough, scurfy texture. As they mature they spread out flat exposing their smooth ‘spore bearing’ top side in a distinctive disc shape. The ‘gummie bear’ flesh inside is dark ochre-brown which is more rubbery and gelatinous in damp conditions. It becomes much tougher as it begins to dry out. 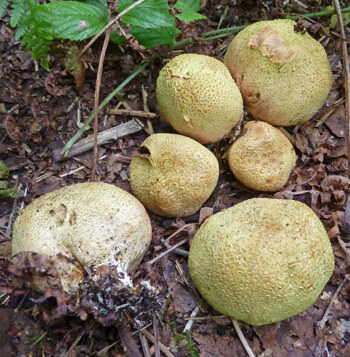 Rubbery or tough – it doesn’t really mater because this isn’t a fungus for the foragers list. However, in Northeastern China it is considered a delicacy. After careful preparation I believe it’s fine to eat – but quite poisonous otherwise. Phytochromes (photoreceptors in fruiting body pigment) can cause serious food-sensitised solar dermatitis – which sounds rather uncomfortable. I think I’ll give it a miss! 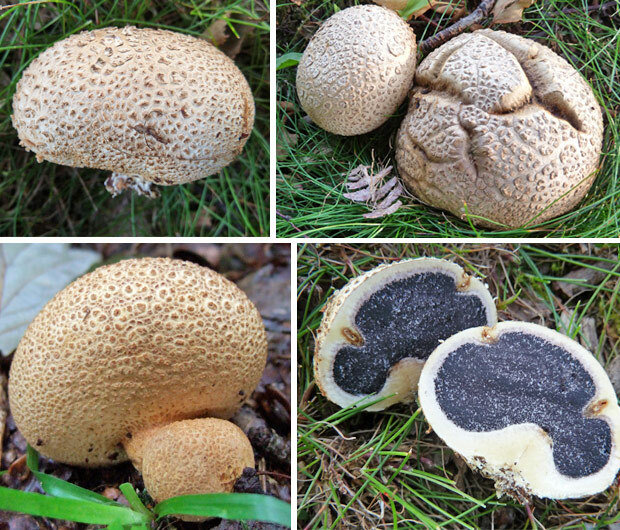 Top: Flat disc shapes of the mature fruiting bodies. Bottom left: Younger cup like examples with a scurfy brown exterior. Due to the damp conditions, this surface appears much darker. Approx 1-4cm across. Jelly-like, rubbery texture. Top fertile surface is smooth, Underside scurfy brown/dark brown. Margin enrolled when young, expanding to a flat disc shape. Spore Print: Dark brown/blackish (see how to take a spore print here). Inedible. Poisonous if not prepared properly. Sometimes some species of fungi grow nearby others. For example, Ceps (Boletus edulis) have an association with the Miller mushroom (Clitopilus prunulus), and it’s always good to know while you’re out and about as it will help you find more of what you want. In this case I’m talking about two types of Cup fungus found on a recent foray, namely the Bleach Cup (Disciotis venosa) and the Vinegar Cup (Helvella acetabulum) both of which occasionally can be seen during spring time on soil in sheltered woodland areas (in this case beech woodland) and sometimes even on lawns too if it’s the Bleach Cup. I would avoid both of these cup fungi for my pot as there are mixed reports from several sources claiming they are edible, while others refer to it as inedible or poisonous. Plus there’s the added confusion with other ‘unknown’ edible but similar looking species. Best avoided then, eh!? But one thing they are, and that’s interesting looking. I love finding cup fungi. They’re a bit weird but always interesting. The Bleach Cup’s English common name comes from the smell of a fresh specimen (It is also commonly known as the Veiny Cup Fungus or Cup Morel (in North America) Morchellaceae family). Have a good sniff and you’ll instantly recognise the chemical like odour of bleach. It’s like it’s just been cleaned! The Vinegar Cup is very ‘goblet-like’ in shape with distinctive veiny ribs coming up around the tan coloured cup itself. This has been described as cabbage-like, hence the usage of another common name ‘Cabbage Leaf Helvella’. ‘Brown Ribbed Elfin Cup’ is another term used but you could go on forever with this. Sometimes it’s best to stick with the latin names. The main point I’m trying to make about these interesting fungi is that they share common fruiting ground (and season) with Morels, in this case the Semifree Morel (Morchella semilibera). After all, they are in the same order of fungi. I’m not sure of other Morels association with cup fungi or all the science involved in why. I just know they do. My luck was in when I stumbled across both these cup fungi. Literally a minute or two later I found Morels close by. The system works! And the Semifree Morel found was actually one of the largest I have ever seen, with a very long cap. It was hiding in masses of leaf litter and was almost missed. Perhaps I stepped on a few others too without realising. Shame! The distinctive smelling Bleach Cup Fungus (Disciotis venosa). Examples shown here were approximately 6cm in diametre but they can grow up to 15cm across. The Vinegar Cup (Helvella acetabulum) was also found near more Morels in Beech and Ash woodland. Many beech leaves tend to hide the Morels from view so take a good look around. Found a Bleach Cup? There’s a good chance there will be Morels growing nearby. 3-15cm across. Saucer shaped. Inner surface dark brown. Outer surface is whitish with darker scurfy scales. Short, thick stork often buried in soil. In soil in woodland and on lawns. Occasional. Spring. 4-6cm across. Deep cup shape. Inner surface darker brown. Outer surface pale with fine downy texture. 1-4cm x 2-4cm. Whitish. Continues up the base of the cup. Strongly ribbed. In soil amongst leaf litter in woods. Spring to summer. The Brown Roll-Rim (Paxillus involutus) is a very common toadstool found throughout the UK and Europe. I have come across it many times in mixed woodland. If picked for eating it can lose it’s toxicity once thoroughly cooked, but over time and if eaten on a regular basis, it’s toxin will enter the bloodstream and systematically cause the destruction of the red blood cells. Not very pleasant and definitely not worth the risk. There’s no real timescale for when and if this will happen, but I think it’s best described as a ticking time-bomb! 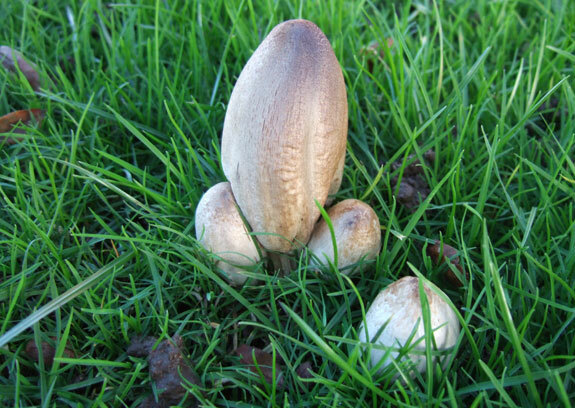 The common name helps describe this naughty toadstool quite well. Naturally a brown toadstool, it’s rim remains ‘inrolled’ although less so when expanded as it grows – see picture on the left – excuse long fingernails!). The texture when younger is finely felted and later becomes smooth (slimy when wet). Size-wise, it can grow from 5 – 15cm in diametre when fully mature and has a distinct hazel brown colour (tawny brown / olive when younger), often dotted with darker orange/brown blotches and the margin may become very wavy. The crowded, decurrent gills are a reliable feature for identification also. They ‘bruise’ dark brown on handling are easily separated from the cap flesh. Being very common in broad leaved and sometimes coniferous woodland (even parks and gardens), you will most likely stumble across these toadstools during late summer to late autumn. They have been classed as deadly poisonous and therefore, to repeat myself again, just avoid them. Several deaths have been reported from Europe. Better the devil you know – to coin a phrase! Note: See comments boxes below. To eat or not to eat! I know I won’t be eating them! 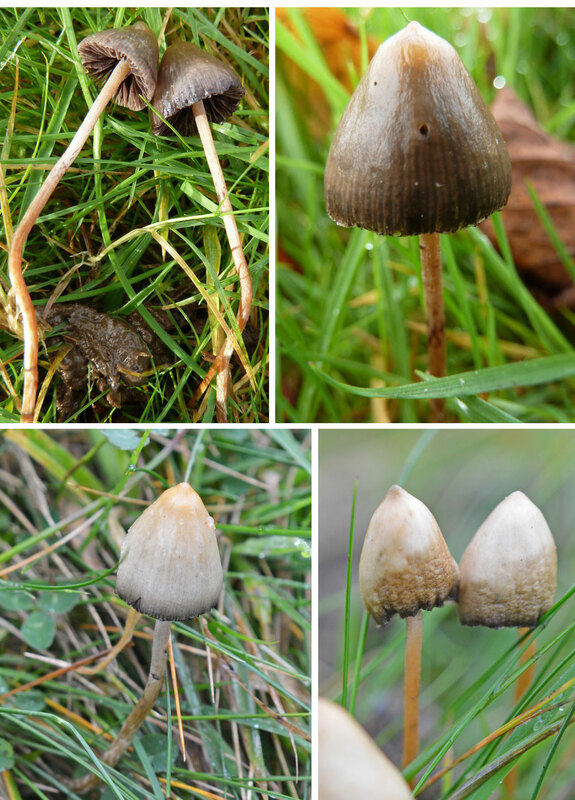 The Brown Roll-Rim Toadstool – Viscid when wet and brusing dark brown on the gills (top). Younger examples are more finely felted when young before becoming smoother. 5-15cm across. Inrolled margin. Ochre – hazel-brown colour (often with darker rain post marks). Downy texture when younger, becoming smoother. Slimy when wet. 8cm x 0.8-1.2cm. Similar but lighter colour as cap. Stains darker with age. Crowded and decurrent. Light ochre to sienna. Bruises darker. Spore Print: Sienna brown (see how to take a spore print here). In broadleaved woodland and on heaths. Late summer – late autumn. Poisonous. Can be deadly. Regular consumption build up toxins within the body. Avoid. This is the first in my posts aimed at the Pluteus genera of mushrooms. Nearly always found on rotting wood including logs, stumps and general wood debris, hence the savvy title. The common name used for this group is ”Shield”, and a very apt name it is too because they always remind me of actual shields – fancy that! 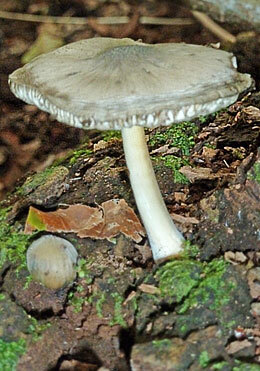 Featured this time is the Willow Shield (Pluteus salicinous). I almost missed several of these on a walk through the woods. The upper canopy had drained quite a lot of the natural light. It was also still dry out there as the recent weather hadn’t delivered much rain – but plenty of sticky warm days! Perhaps the warmth and dryness had taken the moisture out of these beauties, the wrinkled edges in the photos aren’t usually a common feature of a healthy young specimen. Imperfections aside, the Willow Shield is a pretty dull mushroom anyway – but on closer inspection really quite distinct. The first thing that struck me was the colour of the cap. Although it appears a mundane grey in these photos (better captured in image below) there is an overall tint of blue (sometimes green) but very subtle, and that really caught my attention. It’s sometimes hard to capture in a photograph, but part of that may be a trick of light and what angle you view it from – or do I need another camera!? The cap holds further details for inspection. It is noticeably darker at the centre, and after flattening out as it matures it usually leaves a slight umbo (or bump). This central point is very finely velvety to the touch where subtle coloured streaks radiate outwards from it’s centre. The stem itself is a good old ‘uncomplicated’ smooth white (although sometimes with a darker tinge at it’s base). 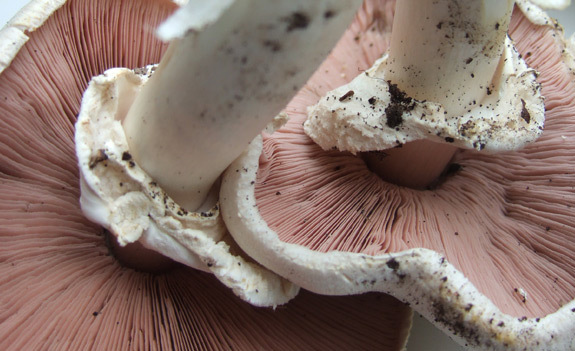 As with all Pluteus mushrooms, their gills are free from the stem and the spore print will be pink. 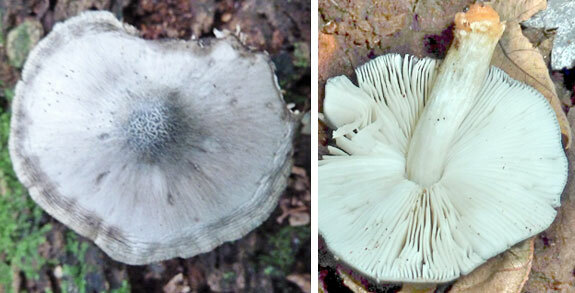 As this mushroom ages, it’s gills will turn from white to pink as the spores mature. And last but not least you’ve probably noticed I have categorised this post in ‘What’s your Poison?’ and ‘Tales of Toadstools / The Inedibles!’ because this mushroom is generally classed as inedible. But I have read elsewhere that unlike other Pluteus species, this mushroom (or now should I say toadstool!?) contains small amounts of psilocybin (compound psilocin). This is the same substance found in Magic Mushrooms (or Liberty Caps). So it’s advisable to leave this toadstool alone. 2-6cm across. Convex the flat with a slight bump (umbo). Bluish or greenish grey. Darker radiating streaks. Darker at centre. 3-5cm x 0.2-0.7cm. White. Tinged with cap colour at base. Spore Print: Pink (see how to take a spore print here). On deciduous rotting wood, especially willow. Spring – late autumn. Not edible. Contains some psilocybin (psilocin). Avoid. • The majority grow on wood or woodland debris/wood chipings etc. • Gills always free, slowly mature from white/pale to pink. It’s a Sunday afternoon and I pass by a grass verge near my house. My heart jumps at the sight of a huge cluster of (what seem to be) Horse mushrooms or possibly Field mushrooms, but this is no field, just a grassy verge near trees at the side of the road! I was without a basket or bag so like a kid in a sweet shop I scooped up a good share, leaving some to drop their spores. Chrome yellow staining on cap edge. Bulbous base. 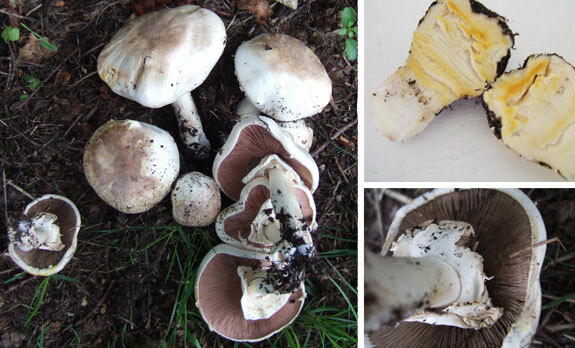 I’m not surprised at all that the Yellow Stainer (Agaricus xanthodermus) is responsible for the most cases of mushroom poisoning in this country. 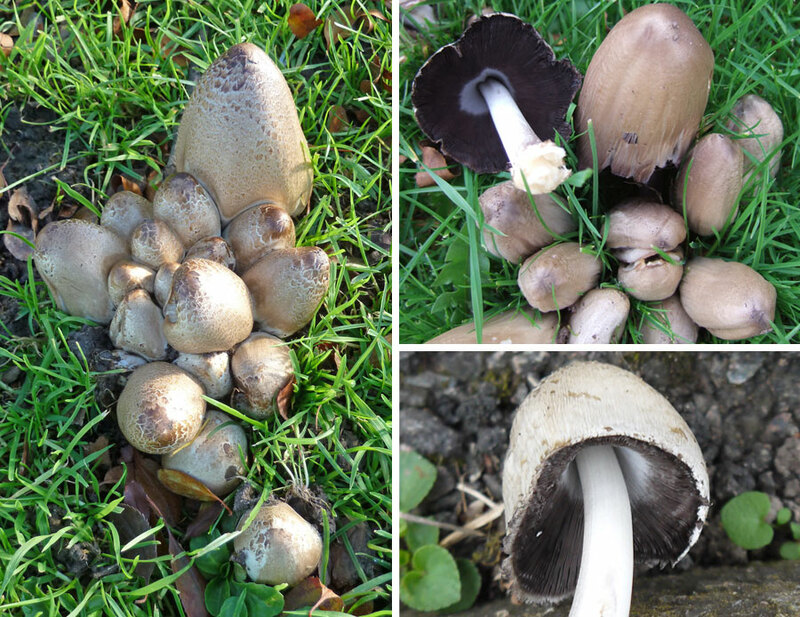 Although this evil twin of our favourite field, wood and Horse mushrooms is not deadly it can keep you in the loo for longer than you normally do! Gastric symptoms can persist for up to 24 hours. Fortunately I have not been caught out yet, but some people after consumption usually get away with only mild upset or sometimes have no reaction at all. My Uncle once told me “Ooh, I don’t get along with those Yellow Stainers – don’t like ’em” . Let’s hope that it was only his palette they offended – I didn’t ask! So how on earth can I identify this poisonous peril when compared to a Horse mushroom? I hear you all cry! Don’t rely on the ‘overall look’. They differ in colour from pure white to brown/grey, scaly and smooth, tall and short and so on. Horse mushrooms can display some paler yellow on the cap and stem – so if you do see some yellow it’s not always a bad thing. Both the Horse Mushroom and Yellow Stainer ‘bruise’ yellow (There’s hardly any yellow about the Field mushroom). But the Yellow Stainer has a stronger chromium yellow once bruised. If you rub the cap with your thumb, there will be a very noticeable colour change. But the crunch test for me is at the very base. Take a knife to the very bottom of the stem (the base is more bulbous than the others) and cut in half (see picture below). If the colour changes to a vivid yellow, then you’ve got yourself a Yellow Stainer. Horse and Field mushrooms do not stain at the base like this. 2. The ring on the stem is large and floppy. 3. Before the veil drops it does not have the ‘cogwheel’ pattern like the Horse Mushroom. In addition to point 3 – if you’re new to collecting mushrooms, avoid very young specimens as they also can be confused with much more poisonous (even deadly) young toadstools. Horse and Field Mushroom lookalike – The Yellow Stainer. Notice the chrome yellow colouring at the base of a cut stem. • Many discolour yellowish, reddish or pinkish when cut or bruised. • Those that discolour bright/chrome yellow should be avoided for consumption. • Gills in young specimens are often pink (white in a few) – maturing darker brown. • Make note of any smells, such as aniseed or a typical strong ‘supermarket’ mushroom smell. This common and cheeky mushroom has a trick up it’s sleeve. If you’re a ‘tea totaller’ then there’s nothing to worry about. Just throw it in the pan, cook it up and get stuck in. On the other hand if you’re fond of the odd tipple – beware! The Common Ink Cap (Coprinopsis atramentaria) inhibits the breakdown of alcohol in the liver, and toxic levels will build up in the body. Ironically, my first discovery of this mushroom was actually on a Sunday afternoon on my way home from the pub! I thought it best to leave it where it was. Had a snooze instead! If consumed with alcohol a selection of symptoms will occur, including hot flushes, redness of the face/upper body, headaches, sweating, shortness of breath and some tingling in the limbs. These side effects, although not too serious, would be very unwelcome after lunch time. So if you’re going to try some, avoid the juice for a good 2-3 days (I’m guessing, as I haven’t tried it myself). Anyone fancy a pint? Anyway, that’s the interesting technical part over with, now on to what our common friend looks like. One of its most striking features which it shares with it’s other family members is the cap itself, which has a distinctive ‘torpedo’ or ‘bell-like’ shape. As it matures it will open up, sometimes only slightly, and begin to lose colour and disintegrate. It’s at this stage the gills dissolve and create an inky fluid. In the past this fluid literally has been used for writing ink. Wonderful stuff. So stay off the booze if you want a taster. Hope it’s worth it. Update 25.04.11 – Just a quick note on the habitat of the Common Ink Cap. Although most of my finds have been in grassland or gardens, this mushroom is equally at home in woodland. Recent discoveries were found at the base of a rotting tree stump and also coming through a pavement next to a wall (behind which was woodland). Their main source of nutrients is from dead rotting wood underground, hence the diverse locations. TTFN. The Common Ink Cap in all its glory, although in a slightly phallic pose! The black fluid from the mature gills has been used in the past as a good writing ink, by boiling the inky cap with a little water and cloves. Also see my post on it’s tasty (non-poisonous twin) The Shaggy Inkcap. Notice the varying yellowish-brown/whitish-yellow colouring, and varying levels of small brown scales which aren’t always present or noticeable. 4-8cm tall. Initially egg shaped, later bell shaped; opening up flatter with age. Grey/fawn colour. Thin fleshed. 6-17cm x 0.9-1.5cm. White, smooth and hollow. Trace of ring near the base. Crowded and grey; maturing brown; to black, eventually to inky fluid. Spore Print: Black (see how to take a spore print here). Grass, parks and gardens. Growing on buried wood. Spring – early winter. Edible but can be poisonous if alcohol is in the body, even from days before and after. • Growing on the ground, wood or dung. • Many young species have woolly veil. Felty scales are often left on the mature specimen. • Smaller species have distinct radial markings on the cap. It’s always nice to come across one of the most loved of all toadstools. I’m of course talking of the Fly Agaric (Amanita muscaria). Most probably you will recall first seeing them depicted in your favourite childhood nursery rhyme or fairytale (or even in a so called ‘Mario’ video game). It was interesting to discover that they were traditionally used as a fly killer by the people of Slovenia (also England and Sweden). Chopped up flesh chunks were placed in saucers of milk or water, which would then release psychoactive compounds, deadly to any fly or bug foolish enough to take the bait. Some consider this story debatable, but one thing for sure is that the iconic and cultural history of this famous toadstool go back a long way, having deep routes in religion, spirituality, and of course recreational use! This mushroom is in the same genus as the Death Cap (Amanita phalloides) but A.muscaria has a different make-up and is rarely fatal (many would have to be consumed). It is not, as some people think, The Magic Mushroom which most people have heard of. 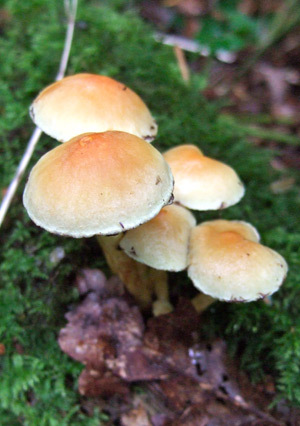 The actual Magic Mushroom or Liberty Cap is actually a Psilocybe species called Psilocybe semilanceata. 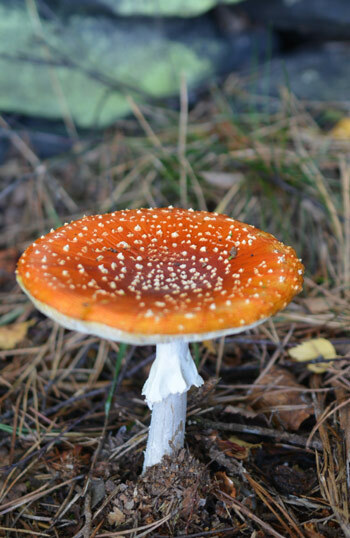 Nevertheless, the Fly Agaric is indeed a famously noted and powerful hallucinogenic. I’ve never felt the urge to experiment (either for culinary or recreational interest) as they do cause sickness, and in some cases produce some very alarming symptoms. However, there are some places in Europe where they still eat them, only after careful preparation (parboiling etc). Hmm! I’m still not sure. 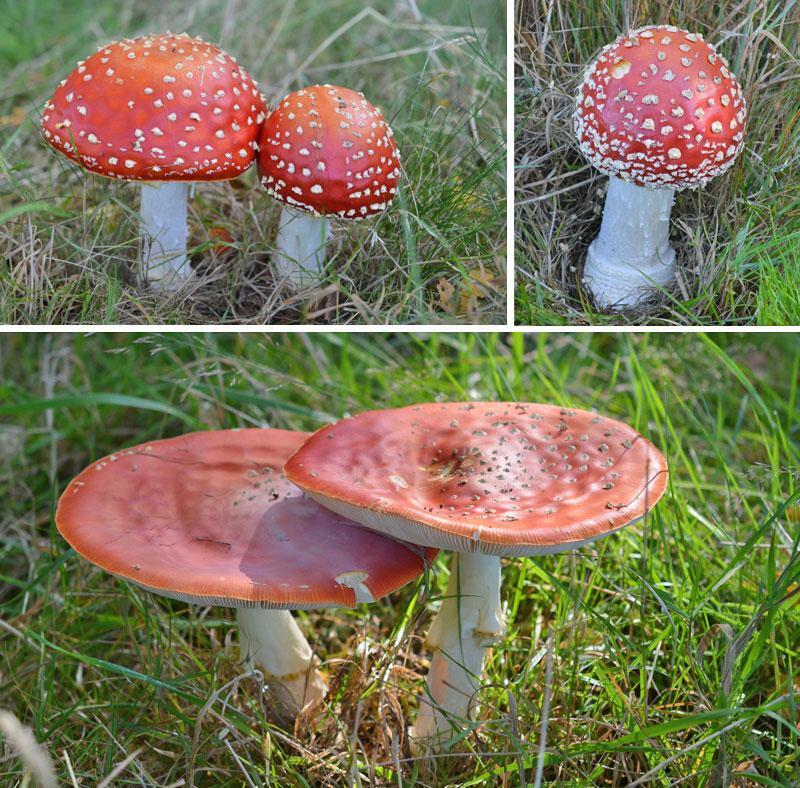 The Fly Agaric contains a compound called ‘Muscarine’, which is one of the poisons found in other mushrooms from the Inocybe and Clitocybe genus, although they are in very small quantities here, hence the minimal reports of serious poisoning and/or deaths. There are many active chemical compounds in the mushroom, but the main psychoactive agent is called muscimol. Its effect on the brain excites neural transmitters causing the hallucinogenic effects, which are very unpredictable and will differ from person to person. But simply eating this mushroom out right rarely has the effect some people actually want. Yet somehow, somewhere, someone discovered how to get the results they were after – and that was to drink urine! That is, the urine of someone willing to consume the mushrooms in the first place. The psychoactive elements pass through into the urine, while all the other bad elements are all filtered out by the body. All you have to do then is take a drink! There would be minimal or no bad side effects and all the desired good effects – well, hopefully. Several cultures (past and present) have used this practice as a form of religious ritual, recreation and/or spiritually as an entheogen – meaning ‘generating the divine within’. Whatever your stance is on the ‘use’ of this mushroom, there’s no doubt it is one of natures most interesting and beautiful species. And if you do find some this autumn (or late summer) be sure to look out for any Ceps (Boletus edulis) hanging around nearby – they sometimes will be growing in the same vicinity. Good luck. The Fly Agaric’s Red cap with white spots (veil remnants). Bottom: Notice that over time from weathering/rain etc. the cap can fade in colour and the white veil remnants can be washed off, as shown here. 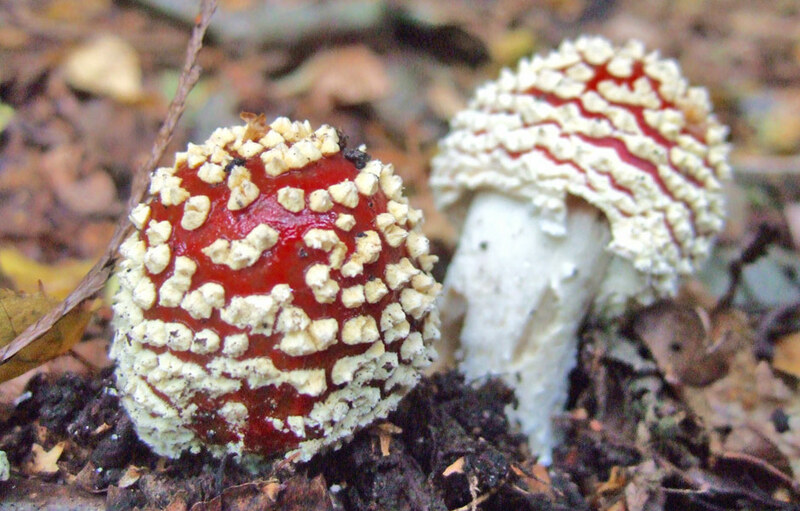 Two young Fly Agarics covered with remnants of the white veil. Note: Bear in mind that extremely young examples of this mushroom growing up from the soil can appear like small white puffballs. There was a case of someone eating what they thought was a puffball, and experienced mild hallucinations but suffered no ill effect, just a bit of a scare! 10-20cm across. Red with white ‘spotted’ veil remnants on the surface; these can wash off with rain and the colour fade to orange-red. Mature cap edge is grooved. 15-20cm x 1.5-2cm. With a grooved ring. Bulbous base with volva that has rings and scales. Woodland, mostly with birch; also pine and spruce. Late summer – early winter. Poisonous, causing sickness. Containing hallucinogens. • All have some sort of Volva – a cup-like/sack-like structure at the base of the stem which is the remnant of the universal veil. • When very young, while still in the universal veil they can look egg-like. • Most species are often covered with ‘spotted’ veil remnants. These sometimes ‘wash off’. • Most species have white/whitish gills. • Be extra careful in identification (examining volva and stem ring if present) as this genus contain some deadly species.